Washington Cake Bake in a brick oven. 1/2 lb. butter 1/2 lb. sugar 1/2 lb flour 3 eggs beat very light & stir into the batter alternately with the flour & add a 1/2 pint of rich milk or cream - if the milk is sour, it will be no disadvantage. 1/2 glass wine 1/2 glass brandy 1/2 nutmeg 1 teaspoon cinnamon - lastly 1/2 teaspoon soda dissolved in a little vinegar. Stir the whole hard. Clay Cake. 1 lb. flour 1 lb. sugar 1/2 lb. butter 6 eggs little nutmeg 1 teacup cream. Spice Cake. Melt a teacup of butter, mix it with 1 teacup sugar & 1/2 teacup molasses. 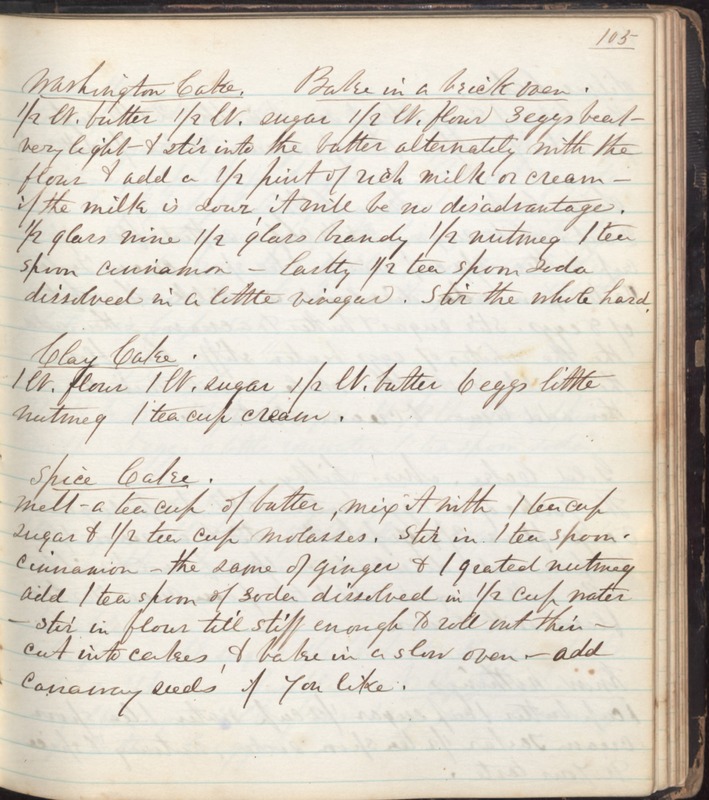 Stir in 1 teaspoon cinnamon - the same of ginger & 1 grated nutmeg add 1 teaspoon of soda dissolved in 1/2 cup water - stir in flour till stiff enough to roll out thin - cut into cakes, & bake in a slow oven - add carraway seeds if you like.